In 1856 the Atlantic, Tennessee and Ohio Railroad completed the track from Charlotte to Statesville. The Railroad saw a need for a Depot with a sidetrack and cotton-weighing platform in Southern Iredell County. John Franklin Moore offered land for the site as well as lots for sale to anyone interested in building a town. The place was named Moore’s Siding in honor of John Moore and his generous gift. Moore’s Siding was incorporated in 1873 and the name was changed to Mooresville. John Franklin Moore died only 4 years later and was the first person buried in Willow Valley Cemetery. 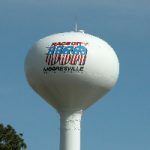 Mooresville continued to grow over the years. As of the year 2000, the population was 20,000 up from 9,000 in 1990. Mooresville continued to grow over the years. As of the year 2000 the population was 20,000 up from 9,000 in 1990.